Help improve Atlas Obscura by expanding Bishop Baraga Shrine with additional information or photos. 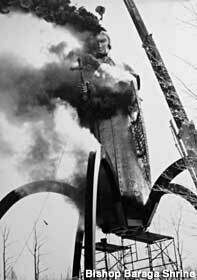 Bishop Frederic Baraga looms large over the Upper Peninsula of Michigan, both figuratively with his 37-year legacy of missionary work with the Ottawa and Ojibwe tribes and immigrant miners, and literally with a 35-foot high brass statue at a roadside shrine. Earning the nickname “The Snowshoe Priest” by traveling throughout the Upper Peninsula and along Lake Superior in brutal winters well into his 60s to minister to his flock, Father Frederic Baraga was named Bishop of the new Diocese of Marquette in 1853, and died in 1868. Near a trail that he and the Ojibwe used, the shrine features a statue 35 feet tall on 5 beams, sculpted by Jack E. Anderson. The shrine also has a Catholic gift shop with homemade ice cream Monday through Saturday. A comedy troupe's collection of bizarre humor. Reason for Michigan's potential diamond mine.